You are here: Home / Fireplaces / Why Choose A Closed-Combustion Fireplace? Closed-combustion fireplaces are extremely efficient. A traditional open fire converts around 20% of its fuel into usable heat. The balance turns into ash, smoke and hot air which escapes through the chimney. A closed-system fireplace is designed to minimize the loss of heat, and to burn as much of the fuel as possible. Closed-combustion fireplaces recirculate the hot air before allowing it to escape through the flue, and burn at a high enough temperature to re-ignite the recirculated air. Closed system fireplaces are more expensive than traditional open fireplaces, because of the relative complexity of construction. However, in the long term, the saving on fuel will more than pay for itself. Because closed system fireplaces are sealed, you won’t have to deal with smoke filling your house. Closed system fireplaces are much safer than open fires, because there is no risk of sparks igniting nearby fabric or carpet. Closed system fireplaces are designed to be used in smoke free zones, with extremely low smoke emission. How do I choose the correct size closed-combustion fireplace? It’s important to choose the right size fireplace for your room. The size of fireplace you choose depends on the size of the area you want to heat. A fireplace which is too small for the room won’t be able to heat the room properly. On the other hand, if you buy a fireplace that’s too big for the room, you will need to keep the room temperature down by limiting the air intake. Closed-system stoves are most efficient when they are operating at the temperature for which they are designed. Cutting the flow of air means that the fireplace is not going to work as efficiently as it should, resulting in incomplete combustion of the fuel. This means that the glass will become dirty, the flue will accumulate soot and more sooty particles will be emitted into the environment. Most closed-system fireplaces are fitted with fire-resistant glass doors, which allow you to enjoy the sight of the flames. Modern designs have even larger glass doors than ever. An air-wash cleaning system ensures that the glass stays clean. Closed system fireplaces are generally manufactured from cast iron, which retains its shape through years of heating and cooling. This means that the joints and doors always remain tight. Rope gasket seals are used to prevent smoke and soot from escaping into the room. from the wood. Cleaning is only required after the fireplace has been used several times, i.e. once or twice a week. What is a multi-fuel fireplace? fire is refueled and the ash pan is emptied every 12 hours, it can burn continuously. Closed-system gas fireplaces are also available. These are also very efficient. There are no fireplaces on the market which burn both gas and solid fuel. Although the outside of a closed-system fireplace is very hot, the potential for accidents is much smaller than with an open fire. Small children soon learn to stay away from the fireplace and enjoy the heat. 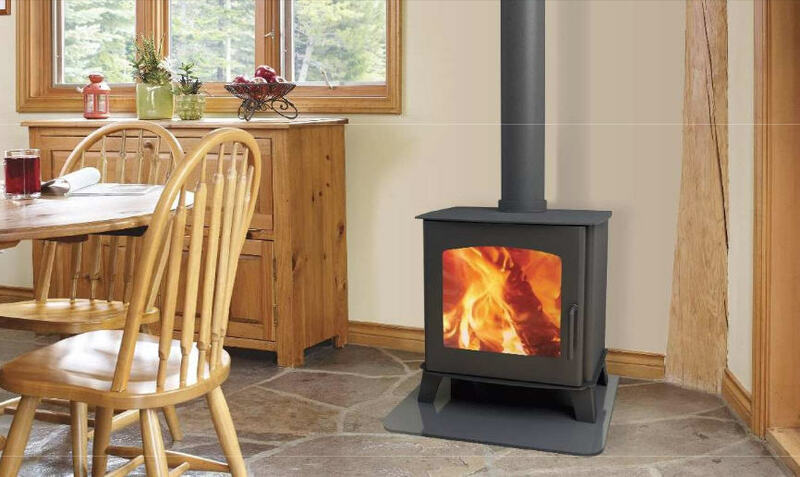 Closed-combustion stoves generally provide a flue outlet on the top or on the back of the unit, with some models offering both, and some also providing an outlet on the side. 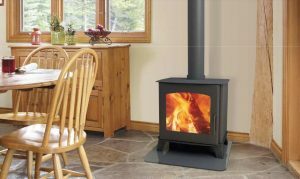 If you have an existing fireplace and chimney, the new stove can be placed in the fireplace, with the flue feeding into the chimney, but special care needs to be taken to ensure a proper draw up the chimney. It is important that any fireplace be installed professionally.